Hey all, sorry you if you've been trying to get on this blog but it wasn't working. I've finally got it up and running again and it's back to normal. Yes, this post is a little overdue but hey. So after years of wanting one, at the end of March I got my first tattoo! I've always loved tattoos, been fascinated by them, so I knew that eventually, one day, I would get one. I thought I would share a little bit about the process, the pain, the aftercare and why I chose this particular image to be tattooed on my body for the rest of my life. It's a dreary, last day of March and it looks like it's about to rain any minute but I booked this tattoo a month ago and I wasn't about to miss it because of some bad weather. So at 1 in the afternoon I head into the tattoo parlour for my appointment. My heart is beating so loud I half expect the fairly packed shop to hear it. My palms are sweating so much that I'm surprised I was able to hold the iPad I was handed (which had my forms that needed filling out before my tattoo on it). I am terrified. I know this is what I want and I've researched and prepared for it but still the fear has a strong hold over me. But Dan's presence makes the fear manageable. I meet my tattoo artist and he goes through the procedure (is that the right word?) he asks me if this is my first tattoo (I guess I wasn't hiding my fear as well as I thought). He places the transfer on my arm, lowers it with my guidance to where exactly I want it. Then away he goes. As my tattoo is small and fairly simple I knew I wouldn't be sitting there for hours, Dan is sitting just outside of the room (I think there may be a rule where a person with you can't be too close) but as I am so scared I don't think to ask. But being able to see Dan is a great source of comfort, he alternates between looking at my tattoo being done and looking at my face to see if I am OK.
After around 40 minutes (time seemed to stop having any meaning and I have to ask Dan how long it took) my tattoo is finished! My tattoo artist cleans my tattoo, wraps it in cling film, goes through the aftercare process, all the dos and don'ts and I try my hardest to listen and stop my brain from yelling I HAVE A TATTOO!! Tattoo when it was first done! This is the topic that seems to interest people the most when they talk about tattoos and indeed the question I got from everyone is "did it hurt?" The answer? Yes of course it did, it's needles going into your skin BUT it did not hurt as much as I expected. The best description of the pain I can give is that it feels like a hot cat scratch, of course I appreciate that my tattoo is small and therefore probably hurt less in comparison to a tattoo that has more detail and took longer. The outline of the mask only really hurt when it was near the bottom, closer to the inside of my elbow. The most painful bits were the parts that needed filling in like the eyes, mouth and so on. I have definitely had worse pains and I was easily able to manage the tattoo pain. By the time I leave the tattoo shop I am buzzing and it's pouring with rain. I head home and wait two hours before taking the cling film off and giving it a wash with lukewarm water and anti- bacterial soap, a bit of blood and excess ink comes off. For the next five days I wrap my tattoo in cling film when I go to bed but I leave it unwrapped throughout the day. For the next two weeks using antibacterial soap I clean the tattoo and after it's clean and dry I use E45 cream to keep it moisturised. Throughout the first week when cleaning my tattoo bits of scab and excess ink come off but this seems to stop soon enough. I keep my arm out of the bath for 6 weeks to stop it getting saturated which is very annoying but oh well. Now that it's fully healed I keep it moisturised using Lush's Dream Cream and make sure that I put sun cream on it when it's sunny out, especially in this heatwave the UK is going through. Dream Cream is great for tattoos once they've fully healed! Tattoos are things that divide people and can bring out strong opinions, luckily I've not had a mob come after me because of mine, yet. My parents did not want me to get a tattoo but they appreciated that I am 25 and can make my own decisions with my own body. Still my Dad was not impressed with it and hardly mentioned it, my mum said "it was alright for a tattoo". My friends said they liked it and Dan loves it. Co-workers ask me what it is and what it means and give polite smiles, clearly not understanding but bless them for trying. The kids I work with have told me all kinds of new information never known to me before like "they last forever you know" and "it'll look different when you're old". But as with anything to do with my own body, no one else's opinion matters but my own and I love my tattoo. If you've been in my presence for longer than 30 seconds then you'll know I love Studio Ghibli, in particular the films of Hayao Miyazaki. 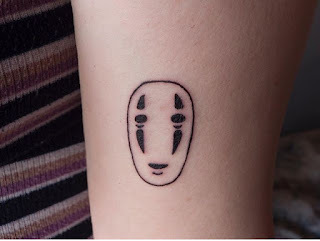 My tattoo is the mask of the character No Face from Spirited Away. No Face is a character who I relate to very strongly. To me he is someone who wants to belong and have connections with people yet finds it hard to know how to act when he is placed in situations with people, this resonates with me and my social anxiety. No Face is also a character who doesn't quite know his identity yet, he isn't fully sure of himself, or who he is and where his place is in the world is. These are feelings that I deal with on a daily basis and this tattoo is a reminder to not dwell on those feelings, to just accept them and work towards becoming the best version of myself I can be. On a less deep level the tattoo also represents my love for Studio Ghibli and Japan and my admiration for Hayao Miyazaki. I owe so much to Miyazaki's films as they have got me through some of my worst times and have been there at some of my best. I love my tattoo so much and know I'll be getting a few more in the future. I hope you enjoyed reading this post and that it was helpful if you're considering getting a tattoo. Do you have any tattoos? What was your first tattoo experience like?